Conditions : Child will share with Parents bed . If Extra bed require, price will be changed. Day 1: PARO-THIMPHU : Arrival at Paro Airport (7,000ft), transfer to Thimphu hotel and visit the National Museum housed in an ancient Watchtower, which has a fine collection of ancient Thangka painting, Textiles, weapons and artifacts. 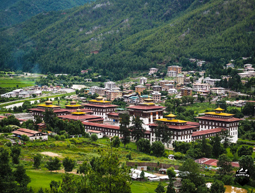 Later drive you through the valley of Paro to Thimphu the capital city. Check in the Hotel. Day 2: THIMPHU SIGHTSEEING: Morning drive to Dochula pass (10,000ft) from where you can see the beautiful view of Eastern Himalayan range in the clear sunny day. Afternoon Changangkha Lhakhang, Motithang mini Zoo to see the National animal The Takin. Drive down to viewpoint from where you have magnificent view of Thimphu valley. Evening if possible you can visit Tashichodzong, the parliament house of the country. 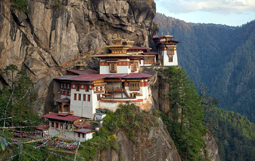 fortress) and later visit Kyichu Lhakhang. Evening scroll down town. Day 4: DEPARTURE: After Breakfast transfer to Airport (own arrangement) for your onward flight.